Create branding opportunities while cutting down on energy costs! 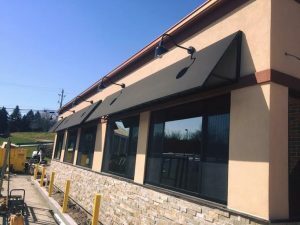 Country Canvas Awnings is a full-service local awning company. Our design team manufactures top quality custom welded frames, canopies, shades and more. There are endless canvas applications that can provide style to your architecture for an affordable price. Please see our commercial gallery HERE to see our past projects. At Country Canvas Awnings we will handle all of your canvas needs from A to Z. We are happy to give competitive bids on any projects involving canvas applications.